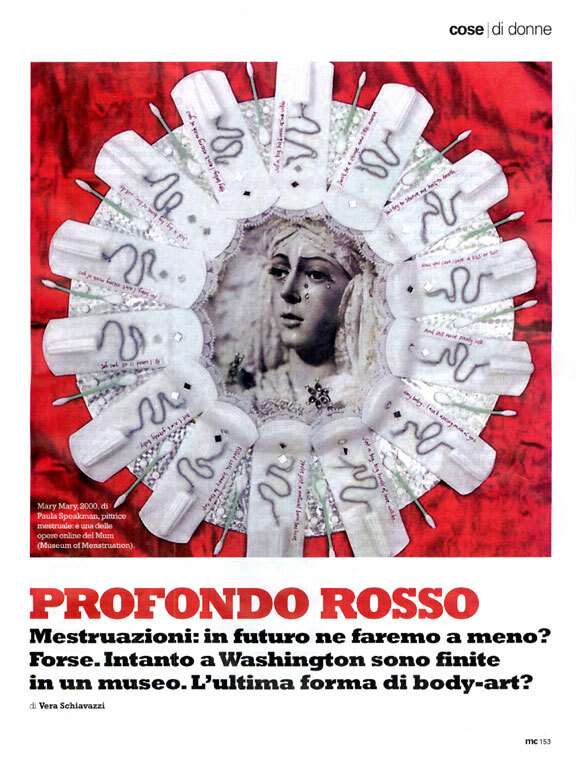 Last year (2003) the photo editor of the Italian edition of Marie Claire asked me to contact several artists in MUM's Art of Menstruation exhibit (here) for pictures to illustrate a wide-ranging article on the culture of menstruation - exactly what this MUM site and the future physical museum are about. She also needed other pictures from this MUM site. Just try to find another stylish publication daring to do this! Facing the interior pages of the five-page article sparkle ads for two expensive jewelry lines, one in platinum, and fashionable eye glasses. Besides cultural information from around the world - religion, words, comic strips, research, and more - the article discusses this museum and mentions Pulitzer Prize winner Natalie Angier (a New York Times science writer), Camille Paglia, Judy Chicago (see her MUM contribution here), Tamara Wyndham (her MUM contribution) and others. Click on the pictures to see the corresponding MUM pictures and information. The picture quality in the original magazine article is far better than my scans below. Marie Claire (Italy) general Web site (not the article below). Read a German article about menstruation and this museum. this museum. Read a German article about menstruation and this museum. Art of menstruation artists on this site.